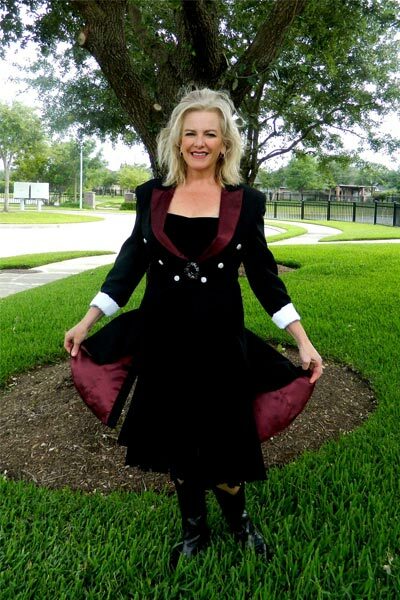 When I had the idea to create the tuxedo tail jackets my primary focus was fun! I want everyone that wears a Lisalynn jacket to have fun, be happy, love who they are, have some attitude and last but not least dare to be themselves. That part of my mission has been accomplished. I have received numerous emails and comments from customers that have reported how much fun they have had when they wearing their tuxedo tails. The jackets are modeled after vintage tuxedo tails that my son owns. To create the tails I reshaped the lapels, restructured the sizes, added vibrant colors, a bit of attitude, rounded the tails a bit more and tweaked a few more things here and there. The jackets are made of quality fabrics and they will last a life time if taken care of properly. The tuxedo tails have been on the market for three years now. I have learned a lot and am continuing to learn new things about the market every day. It is an exciting time to be in the design business and I love this part of my job. I want to thank all my customers, friends, family, and Ron for their continued support and encouragement and their belief in my designs. Also, a special thanks to my assistant Stephanie for always being around and assisting me in everything.